Results of another 24 year old, but have a consult with Defy this week! Hey everyone! I've been lurking for a year or so now, ever since I first found out My testosterone was low. I went to my PCP and she tested several things based on my symptoms and the only abnormal lab was my total testosterone. It has ranged from 190-357 over about 6 tests in the past year. I ended up getting treated for sleep apnea in January of 2018 and have managed it well since then. I have seen two urologists and an endocrinologist in the past year. One urologist started me on Clomid for about three months. Halfway through my estradiol was around 53. HE startd me on Arimidex and it brought my estradiol back down. However, I started feeling terrible on the Clomid (even after controling E2). Even worse than before I started...in all aspects. energy, fatigue, libido, joint pain, memory. He told me to stop and we would retest in a month, well my testosterone crashed back down from 700 to around 250. He said the next step would be to start injections, but would not entertain the idea of HCG. Considering I am soon to be 25, I did not like this idea. I saw another urologist and endocrinologist who basically said Good Luck. They woudnt do anything because of my age and insurance would not cover treatment. The second urologist actually said, "I don't know what to tell you besides, Good Luck." So I had labs drawn from Lab Corp for my consultation with Defy.This is the first time I have had DHT and prolactin tested as well. I am scheduled to meet with Dr. Saya on thursday, but have been quite anxious. I am not quite sure what to expect. Can anyone maybe give me a rough idea of what I can expect with Defy with the labs I've attached? What are some questions to keep in mind during my consultation? What is your overall interpretation of these labs for someone my age? Also, if this is not the correct place for this post, I do apologize and will move it accordingly! Thanks ahead of time everyone! The denial of healthcare coverage by insurance companies is based on the requirements to meet specific testosterone threshold (under 300 ng/dL), representing a transparent desire on the part of the insurance companies to deny treatment and thereby reduce costs. I believe it's terrible they way you were treated, basically because you don't meet requirements for TRT and said good luck, in other words get out of my office and you're not getting TRT no matter how bad you feel. I say it's a blessing in disguise, they probably are not very knowledgeable in TRT anyway which is the case more often than not and would have only worsened your condition. I can tell you firsthand my Defy consultation was eye opening experience, Defy will be able to help you, that's a fact. TRT will address your low DHT and am sure Defy will address the high prolactin as well. I also noticed SHBG is low which frequent injections is recommended, preferably EOD or everyday if you're up for it. Lower SHBG men do much better on more frequent dosing v.s infrequent. It has not been a fun experience at all. My PCP is the only one who showed concern in wanting to get things treated, but she doesnt seem to be very knowledgeable about this subject and was very accomadating in getting me to see the specialists. Everyone said I was "normal" regardless of the terrible way that I felt. It's taken a toll on me in all aspects of my life, including my relationship with my long-term girlfriend. At this point, I am not against being on TRT at my age if it will help. Normal according to this study below is above 440 ng/dL, so again this 300 ng/dL cut off point wasn't chosen based off any clinical studies, this arbitrary number was chosen to save on healthcare costs and your previous doctors know it, it's why they told you to get lost, because there is no money in it for them. These data showed that a testosterone threshold of 440 ng/dL was associated with increased Framingham 10-year CVD risk in middle-aged and elderly men. Poor sexual performance, decreased morning erection, and loss of libido had an impact on the testosterone threshold for CVD risk. The threshold level was higher in men with sexual dysfunction. Testosterone (T) has a number of important effects on the cardiovascular system. In men, T levels begin to decrease after age 40, and this decrease has been associated with an increase in all-cause mortality and cardiovascular (CV) risk. Low T levels in men may increase their risk of developing coronary artery disease (CAD), metabolic syndrome, and type 2 diabetes. Reduced T levels in men with congestive heart failure (CHF) portends a poor prognosis and is associated with increased mortality. Studies have reported a reduced CV risk with higher endogenous T concentration, improvement of known CV risk factors with T therapy, and reduced mortality in T-deficient men who underwent T replacement therapy versus untreated men. Testosterone replacement therapy (TRT) has been shown to improve myocardial ischemia in men with CAD, improve exercise capacity in patients with CHF, and improve serum glucose levels, HbA1c, and insulin resistance in men with diabetes and prediabetes. There are no large long-term, placebo-controlled, randomized clinical trials to provide definitive conclusions about TRT and CV risk. However, there currently is no credible evidence that T therapy increases CV risk and substantial evidence that it does not. In fact, existing data suggests that T therapy may offer CV benefits to men. Your doctor is incorrect, elder men score in the 200-300 ranges. President Trump's scores 450 ng/dL at 72 years old. These ranges do not account for age, men's testosterone peaks in his 20's and when men hit 30, testosterone begins to decline 1% every year thereafter, so eventually by the time you hit your twilights years, you will be in the 200-300 ranges. Critical thinking and analytical thought does not seem to be needed to practice medicine, the reference ranges and guidelines replaces these important human traits. It's really the insurance company saying no, not the doctors. In managed healthcare it's the insurance companies calling all the shots. You have, through no fault of your own, been lost in the valley of medical ignorance and followed by the shadow of insurance indifference. It happens day after day. I congratulate you, though, on taking responsibility for your health and fighting for the care you knew you needed. Put your worries aside as you go into this consultation with Defy. I would suggest you spend time preparing any/all questions that occur to you (nothing is out of bounds) and take notes during your discussion. Let us know how this unfolds. I have many questions and I will definitely update how it all unfolds. 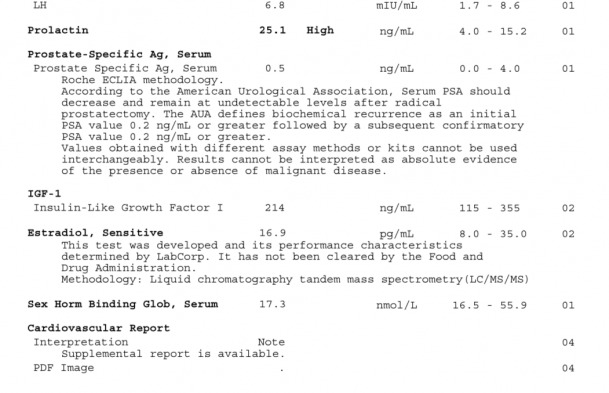 Do you have any questions that you think should be a high priority after seeing these lab results? Ive only learned a little about DHT and prolactin since having it tested, so I dont know what to ask in that area. All I know is it seems as if Cabergoline is a viable option for my prolactin, but I am not too keen on that idea from what I've read. I'll be sure to voice my concerns in that area though. You are wise to be cautious about ANY drug you are about to take. A good doctor isn't threatened by that, and @Dr Justin Saya MD is a fine doctor. Raise your concerns about those values, how they may be impacting your health and what options there are to treat them. Prolactin, when elevated, can hammer your libido - a problem (low libido) so many of us on this road work to overcome. Don't worry that you don't have specific knowledge or a question prepared in advance. This isn't a ten minute drive-by consultation. You can simply walk through each line on the test result report and ask for clarity. I am not not a Defy patient, I live in Canada, but I respect Dr. Saya and assure you that you're not going to be rushed through the appointment. My consultation is in just a couple of hours and i have been preparing some questions and writing down my old lab work. I came across something I did not notice in the past. The urologist I saw diagnosed me with secondary hypogonadism, but I see that my LH was 4.3 (1.5-9.3 mIU/ml) and FSH was 1.9 (1.6-8 mIU/ml) in February of last year, but earlier in January my LH was 6.8 (1.7-8.6 mIU/ml). Wouldn't this normlly indicate priary rather than secondary hypogonadism? But at the same time, Clomid would have not raised my total testosterone levels into the 700s if that were the case, right? Exactly. Clomid stimulates the pituitary to release LH and FSH. LH then stimulates the testicles to produce testosterone. So if you were primary, your testicles would not respond to the LH signal, and therefore your total testosterone would of been a lot lower while on clomid. So the fact that your testosterone level was 700 while on clomid, is a pretty good sign that you’re secondary. It’s also not completely black or white. You can be a mix of both. Your testicles could be responding to the LH signal, but not as much as they should be. So maybe that’s what’s happening. Either way, you’re definitely secondary to some degree. For anyone who's interested in more detail on LH, the chart below, with sampling every five minutes, shows why you can get widely varying values. If you happen to sample on a peak then you can get a fairly high value, even with secondary hypogonadism. Average values will be lowish or normal. 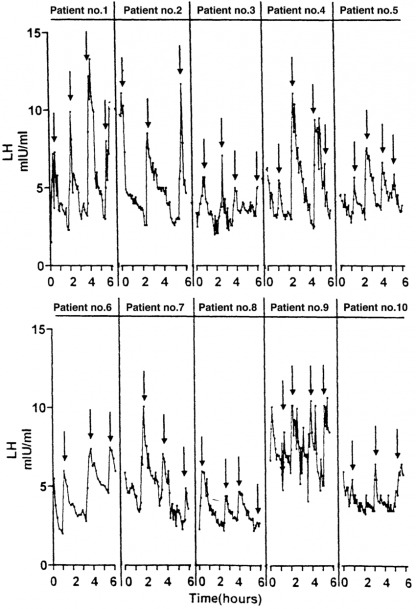 With primary hypogonadism LH is more consistently elevated and often at or above the top of the normal range. Just an update. The consuktation with Dr. Saya went well, he offered me clomid or TRT. He said usualy he woud mandate trying Clomid, but since I've already tried it and did not feel well it was up to me. 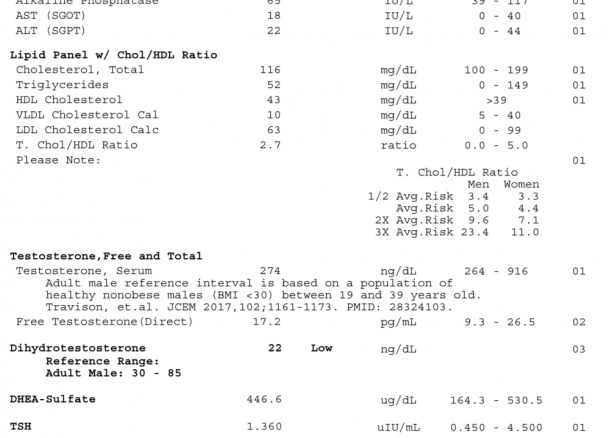 I decided to proceed with TRT simply due to the fact that the effects of my low testosterone are becoming worseand causing problems in many aspects of my life. Also, he mentioned that I do lean more towards primary hypogonadism, but he wants me to have an MRI done to check for a prolactinoma. I will be starting my therapy this week. HE prescribed .2mL (40 mg) test cypionate on M,W,F as well as 250 iU of HCG on the same days. I am also prescribed .125 mg of Anastrazole to take if I begin to notice symptoms of increased Estradiol. I did mean to ask him but I forgot, what should I expect to happen with my elevated prolactin while on treatment/when I have my increased testosterone? If your prolactin remains elevated it will typicall be treated with cabergoline to bring it into line. I underwent an MRI, no issues with the pituitary were discovered. You are in good hands. Good luck with everything. I know what it feels like to be denied the care you deserve and I also know what it feels like to finally find someone who can help. Your life is about to change for the better. My PCP is reffering me for an MRI. Met with her yesterday. Also, started my TRT regimen yesterday. Looking forward to feeling better and getting things back to "normal". I do have one more question, instead of me starting another thread. Is it unheard of to take anastrazole prohpylactically? MY E2 skyrocketed while on Clomid, but Dr. Saya said it may or may not become elevated and even if it does, I may not experience adverse effects at those levels. Something to do with the Clomid and it's mechanism of action. I am prescribed .125 mg to take on days of injections if I notice side effects. Thanks for all of the advice and support here! I’m only 6 months into TRT myself so take it for what it’s worth but I started 0.125mg anastrozole w/ my injections twice per week as directed. Worked out great for me (actually likely that i’ll need a bit more soon here) but I understand the desire to wait. Word is bring up a low or “crashed” estrogen level is harder than adding some more anastrozole so alot of folks like adding it in after having their e2 get a bit high. I’m no doctor but if it were me i’d either add it right away or leave it out until after 6 week follow up blood work. Reason being is it takes 6 weeks or so for blood levels of T and e/m2 to get stable so you dont want to judge the way you feel to harshly before the 6 week mark. At which point you can get blood work and re-eval from there. You want to do your best to avoid getting on a rollercoaster of feeling good, then bad, then good etc. Let us know what you end up doing and how it goes. Just got the results of my MRI today. I had it done yesterday with and w/out contrast. They said I have no visible problems with my pituitary. However, they noted a cyst in my left sinus area. So, I'm curious as to why my prolactin is elevated and what I can do to bring it down, besides starting cabergoline in the future.